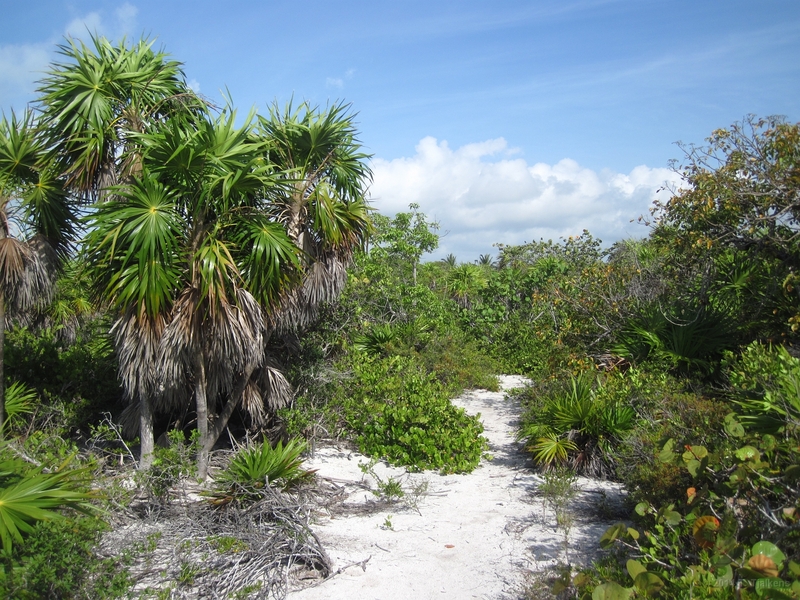 1 From Punta Allen you can walk to the lagoon following this trail. 2 The beaches near Punta Allen are white with palm trees. 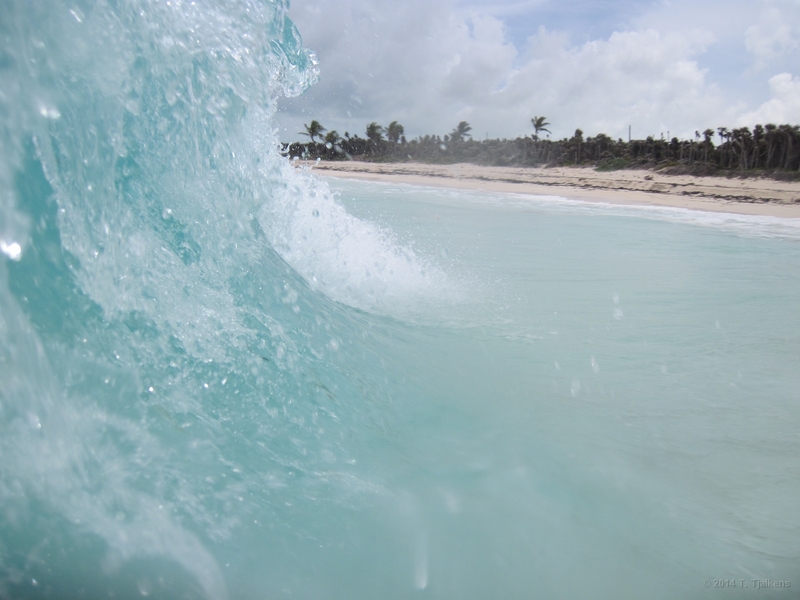 Unfortunately the hurricans strike hard at this part of Mexico, so most palm trees are damaged and there is a lot of plastic washed on shore. 3 From Punta Allen you can take a boat to the nearby islands. 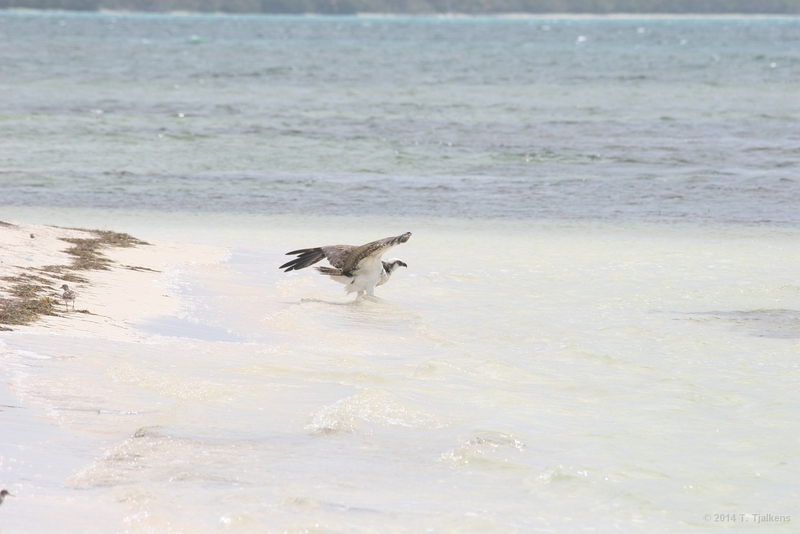 The locals call the bird islands and that's what they are. 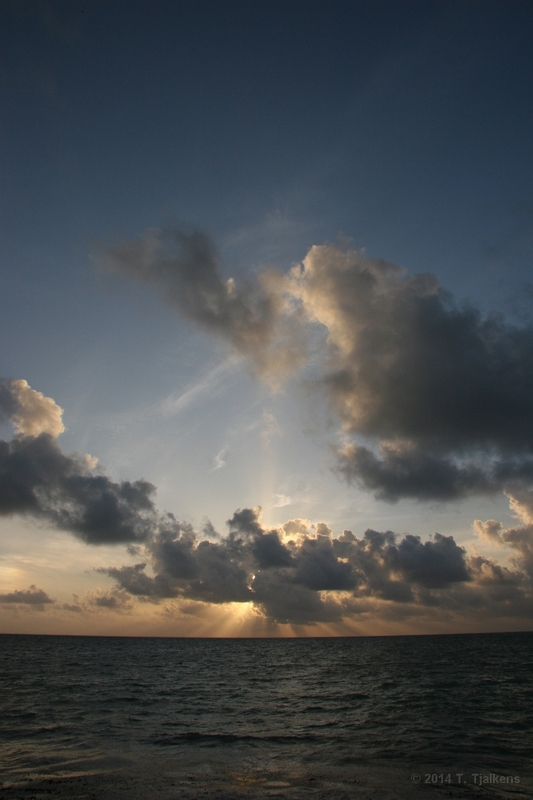 Pack you stuff waterproof because this is a really rough ride on the open sea! 4 A red starfish, I bought a new waterproof camera so I could take this picture under water. 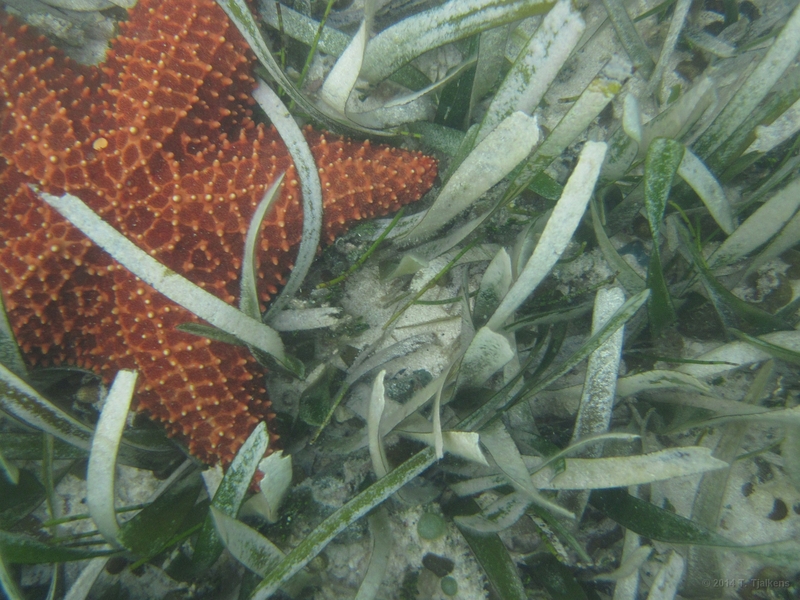 There are a lot of different starfish close to the shores of Punta Allen. 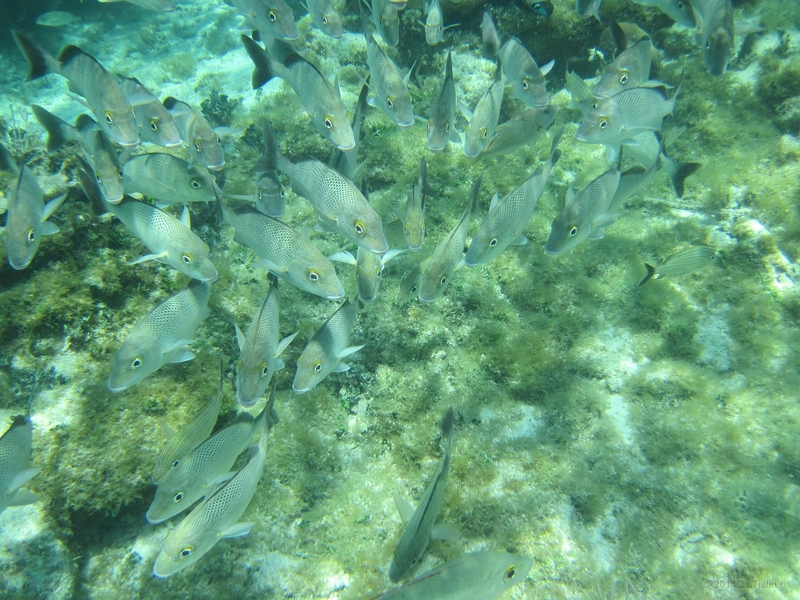 5 Lot's an lot's of fish near the reef. 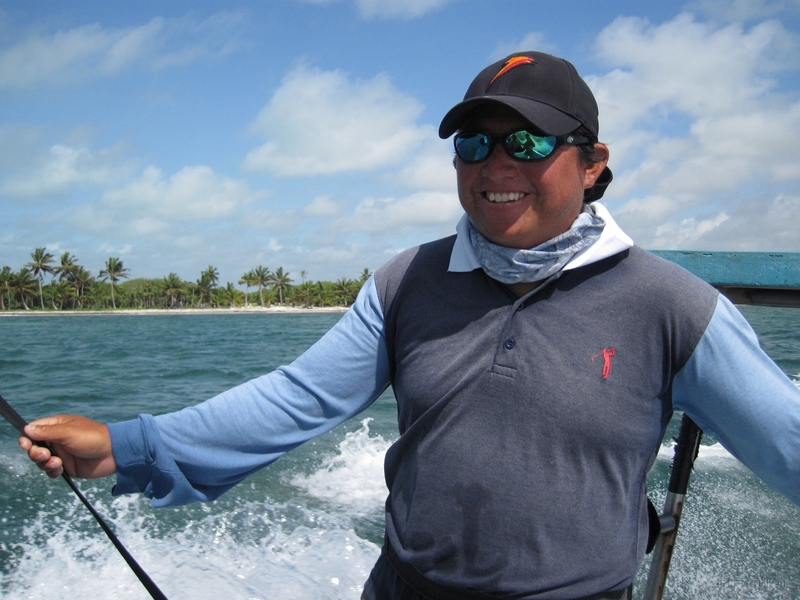 The corals are not so beautifull (damaged by hurricans) but there is an amazing amount of fish. 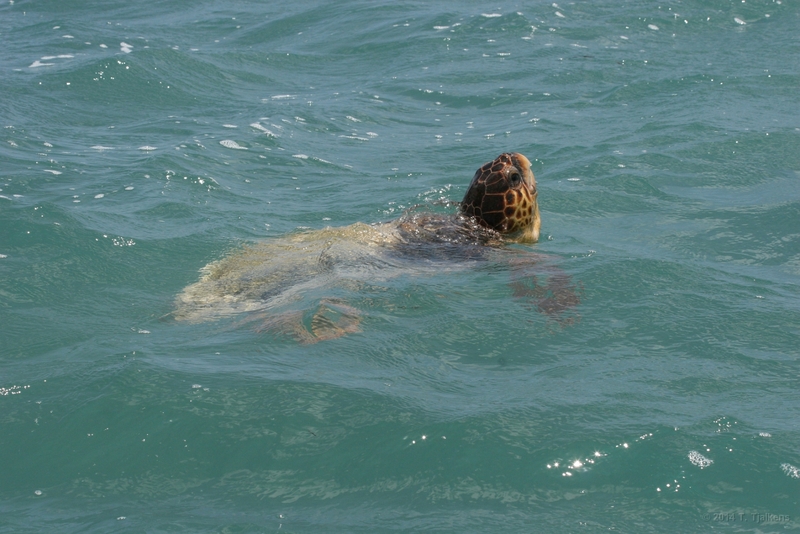 7 A seaturtle catching some air. 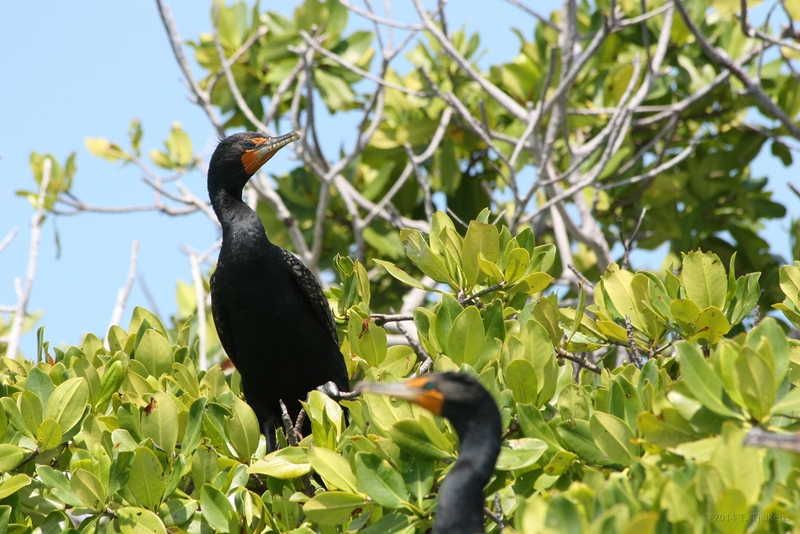 8 Two Neotropic Cormorant in a tree at birds island. 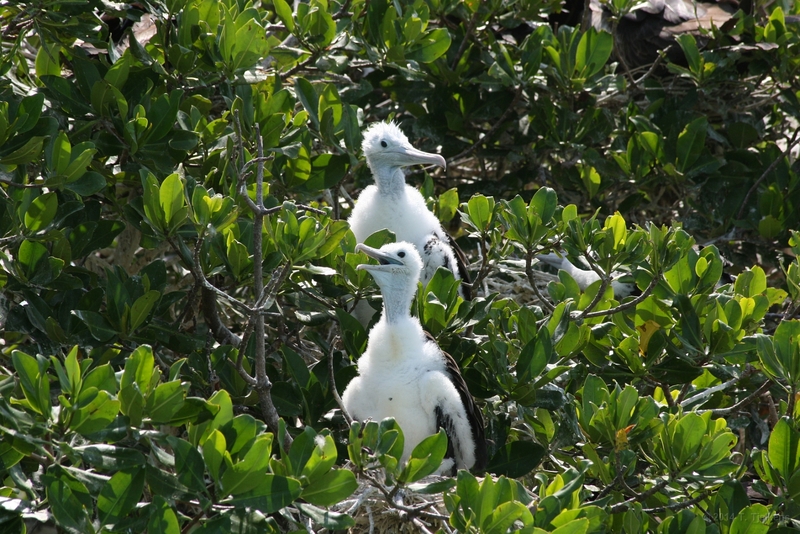 9 There are also a lot of chicks from the Great Frigatebird in the trees. 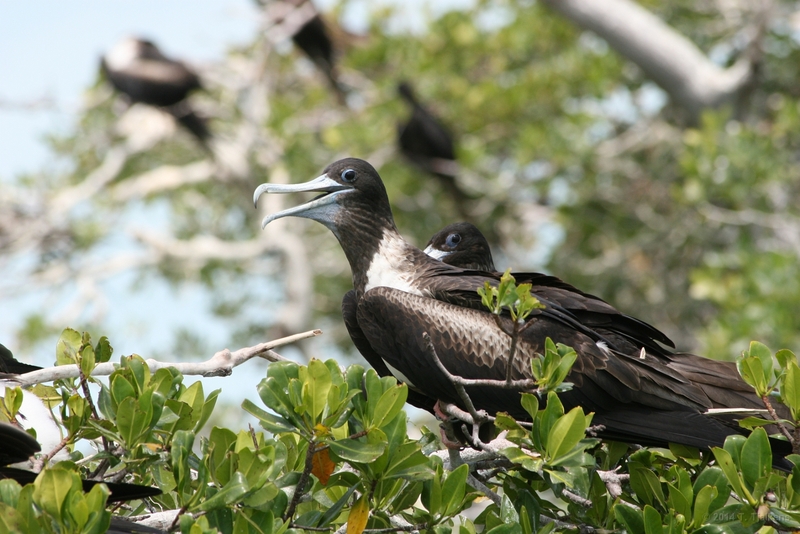 10 To attract female the male Great Frigatebird is able to distend its striking red gular sac. 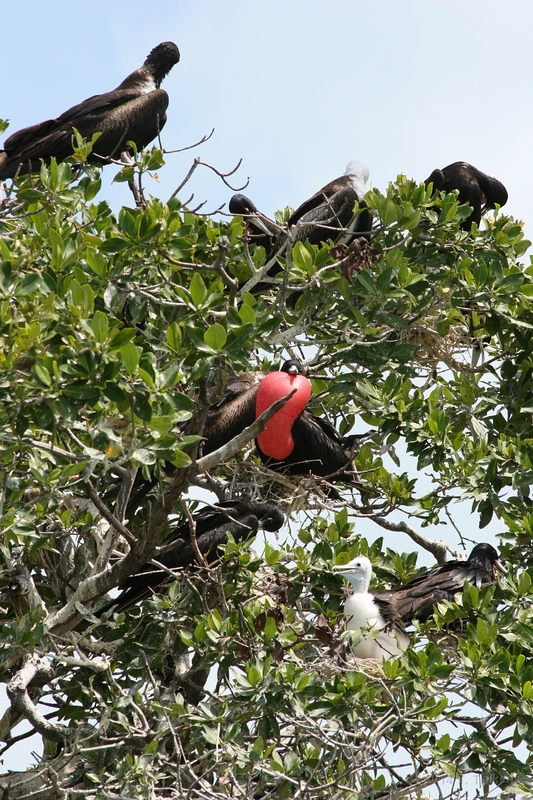 11 An other two Great Frigatebirds in a tree at birds island. 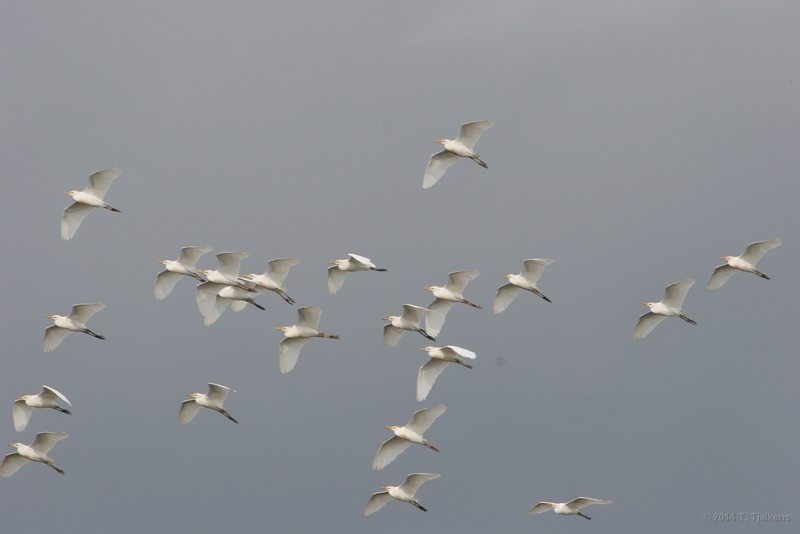 there are hunderds of them on this islands. 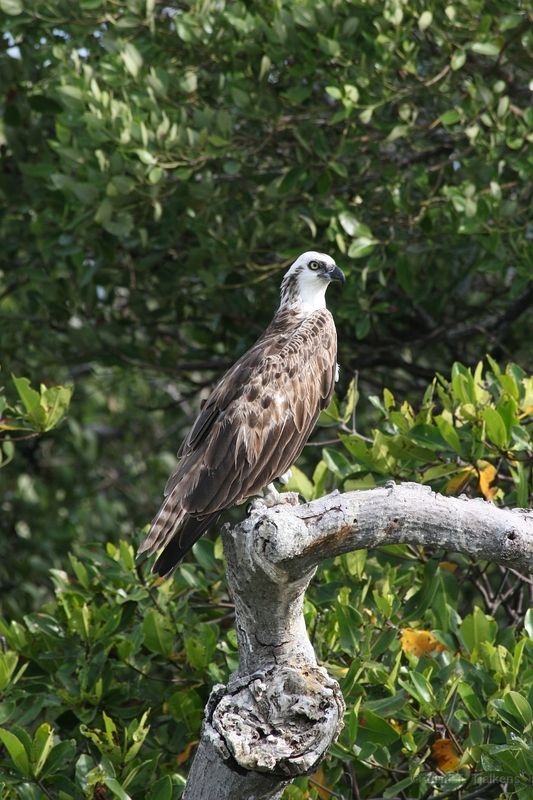 12 A Osprey (fish hawk) on a tree in the lagoon. 13 A crocodille near the shore. 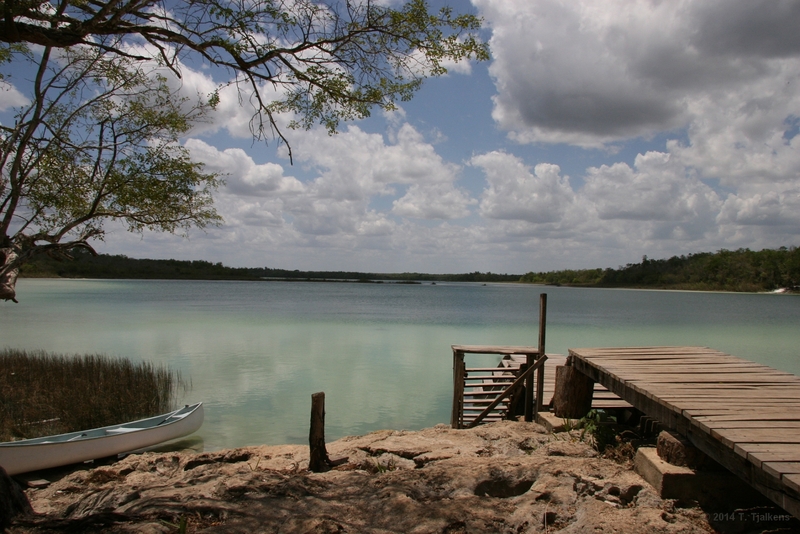 There a many crocodilles in Sian Ka'an so it's not adviced to swim in the lagoon. 14 Sitting in front of ouw cabina you can see the sea. 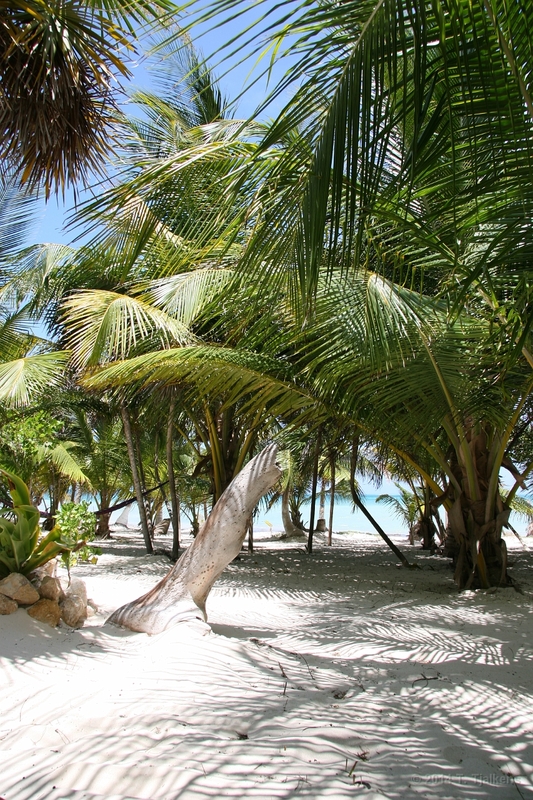 Beautifull white sand and palm trees make this the perfect spot to relax. 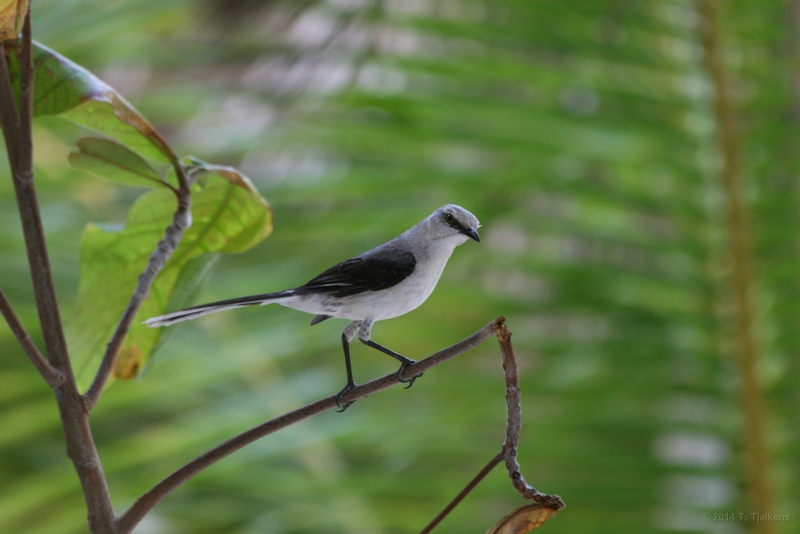 15 A wagtail (?) near our cabana. 16 On our way to the Punta laguna lives a small Maya community. This is a photo of their village. 17 A Spider monkey in the park of Punta Laguna. 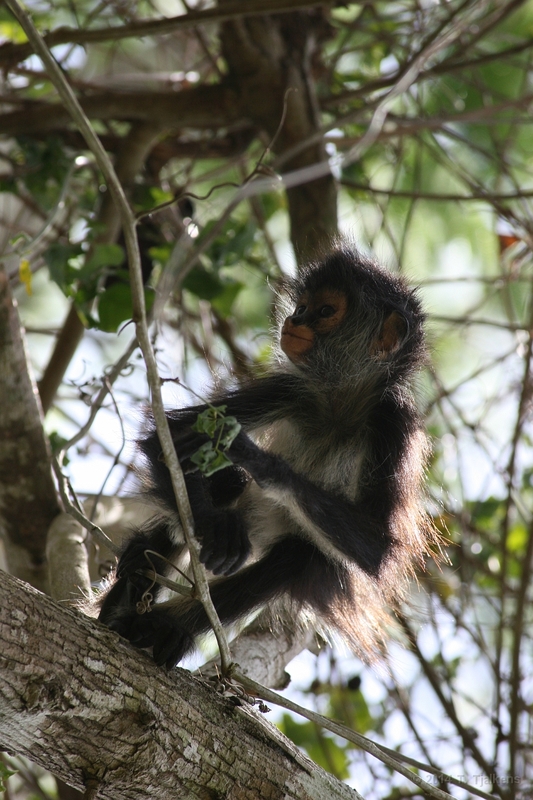 Spider monkeys only live in original jungle which is never been cut down by people. 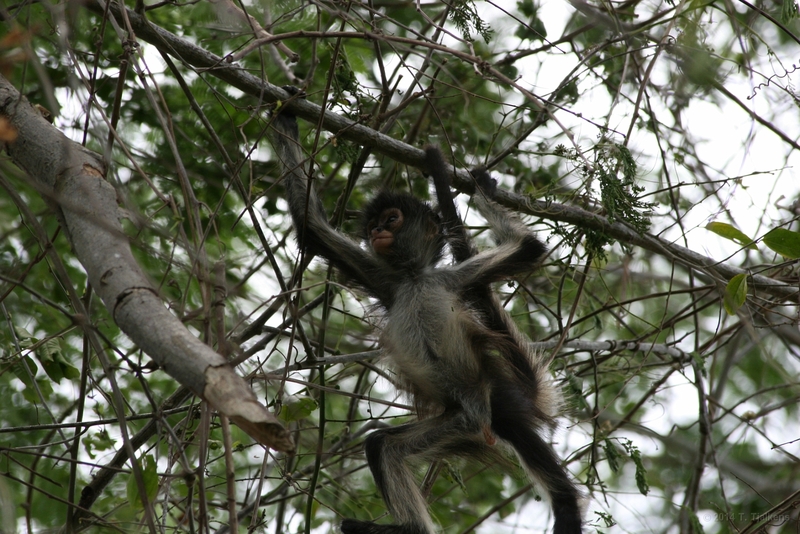 18 An other small spider monkey in the trees. 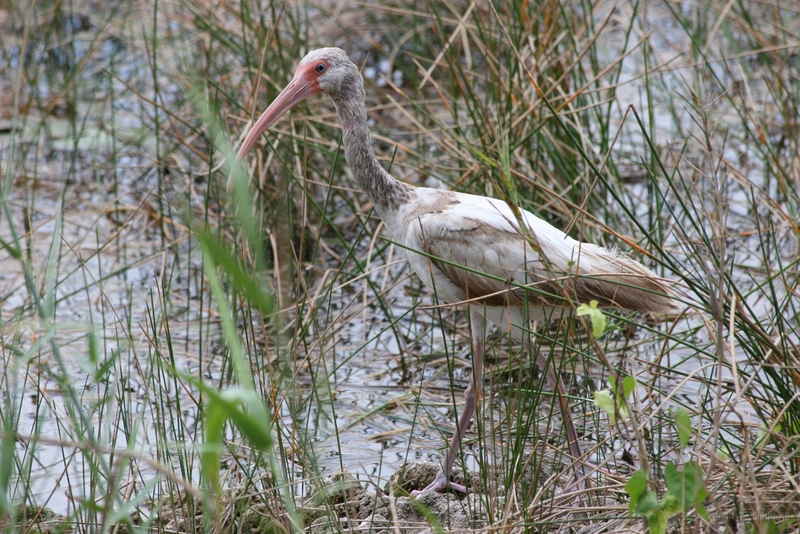 19 An Ibis in the lake of Punta Laguna. 20 A great view over the lake from Punta Laguna. 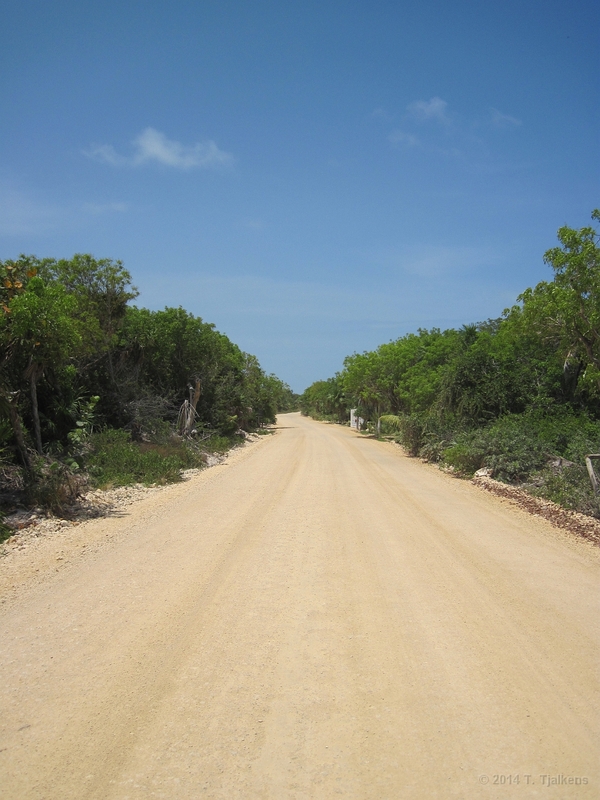 21 This is the road from Tulum to Punta Allen, the best part anyway. The rest of the road is only accessible with a 4X4. 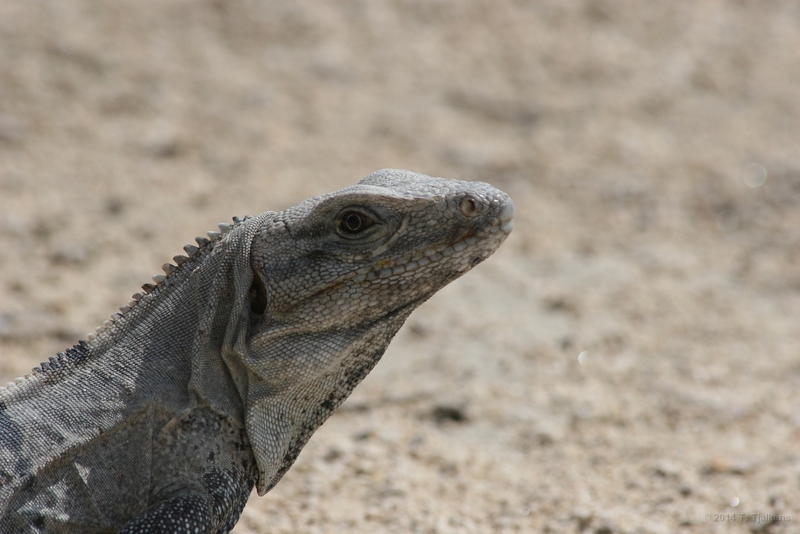 22 A lizzard, these lizzards have a blue belly and like to sit on the road to catch some sun. Needless to say that sitting on the road is a dangerous habbit in Mexico. 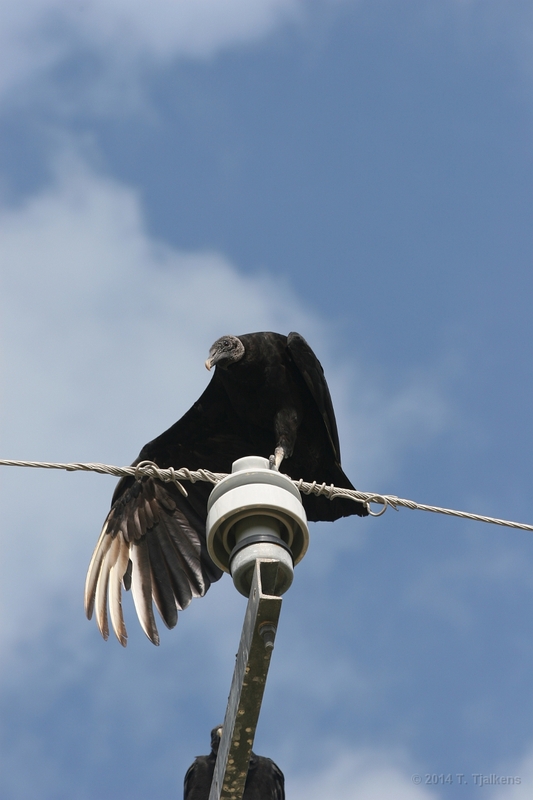 23 The vulture sits also near the road, to eat the roadkills, mostly the lizzards from the previous picture. 24 A barracuda in the river from the lagoon. 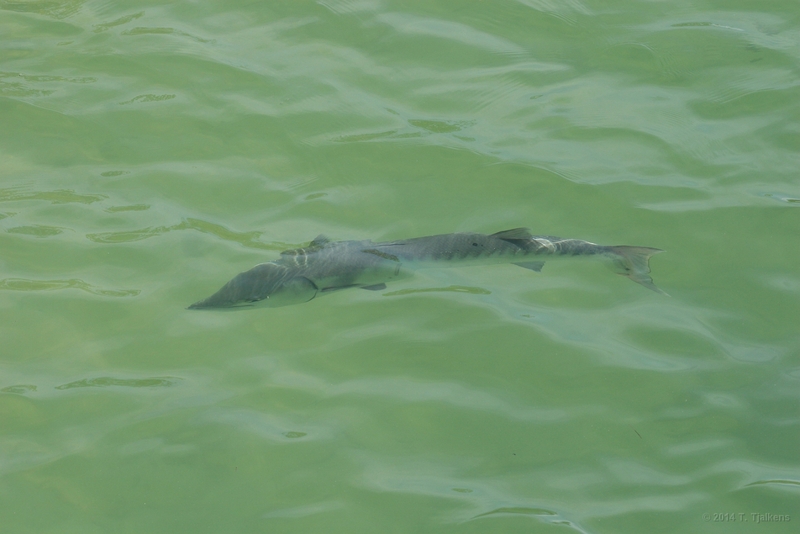 It's a very big fish >1m and a predator. 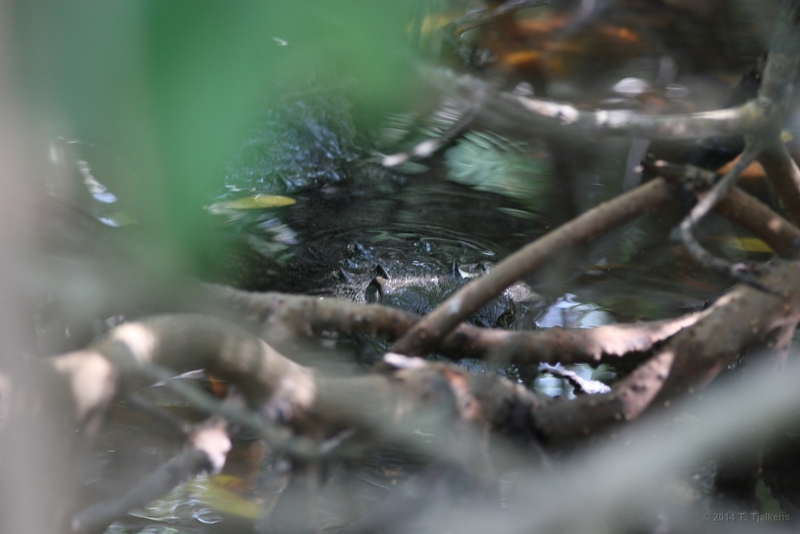 25 Smaller fish are common in the river, they are food for the barracuda's. Local fisherman fish them also. 26 Sunset over the Carribic, always a beautifull sight. 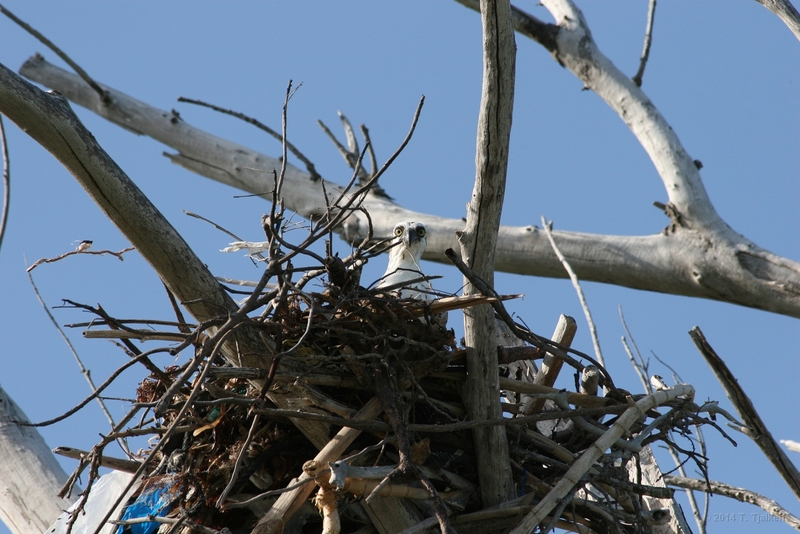 27 An other sea hawk on his nest looking at me while I'm taking the photo. 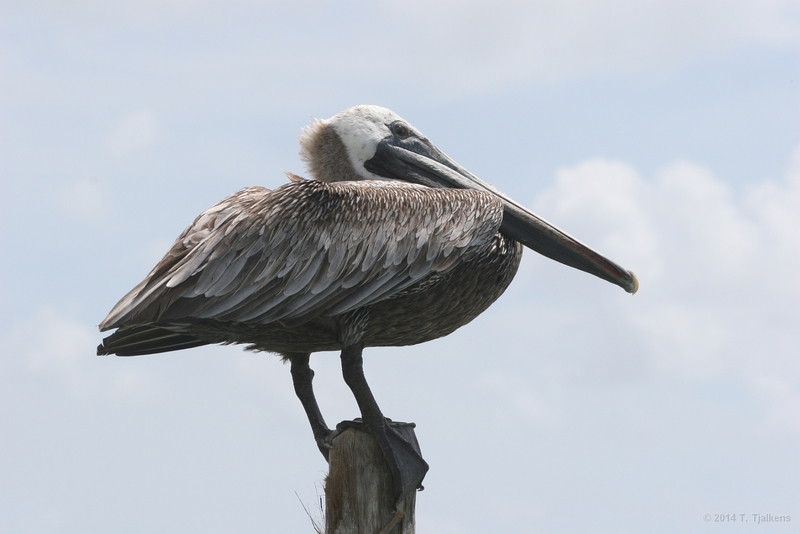 28 pelicans are very common near Tulum and Punta Allen. 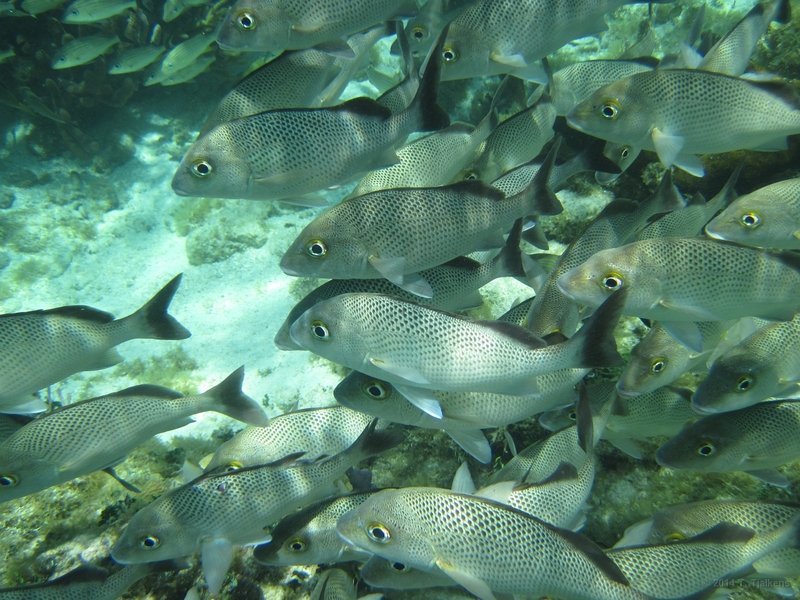 They dive for fish. 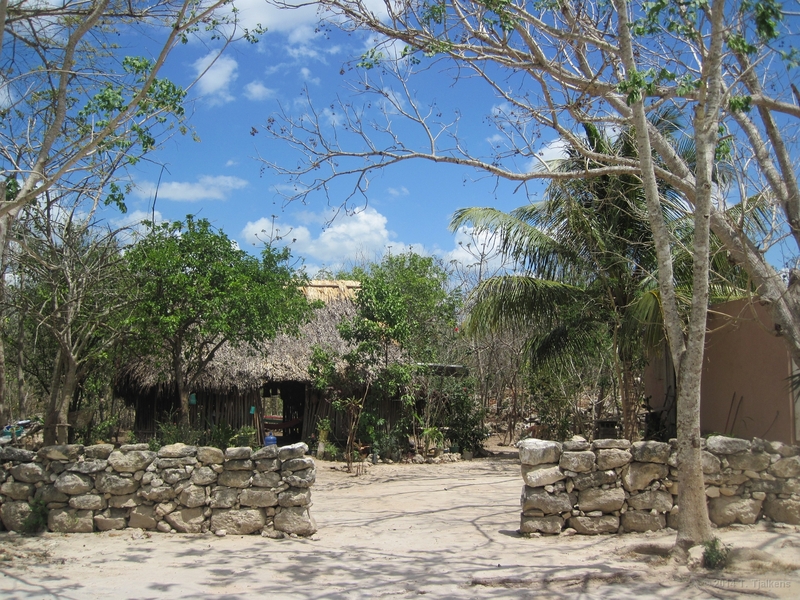 29 Tulum is an acient Maya city. 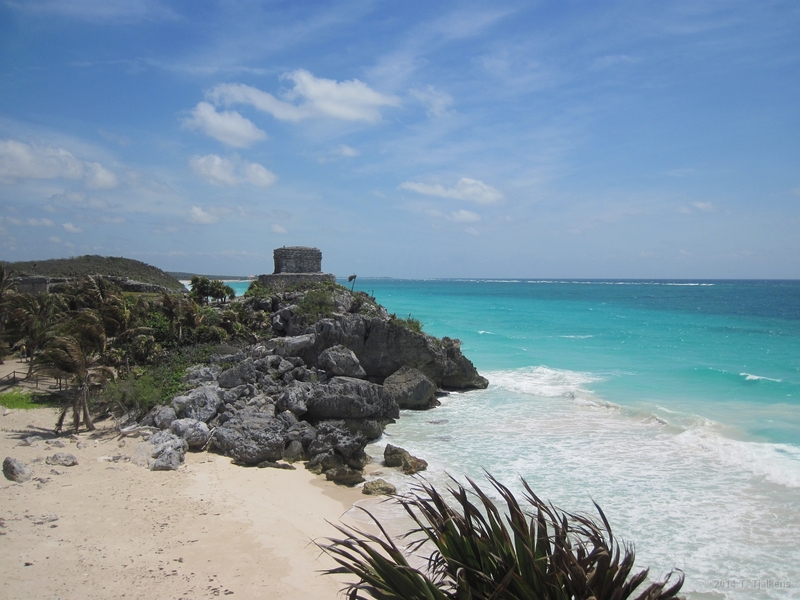 The only Maya city ever build on the coast. 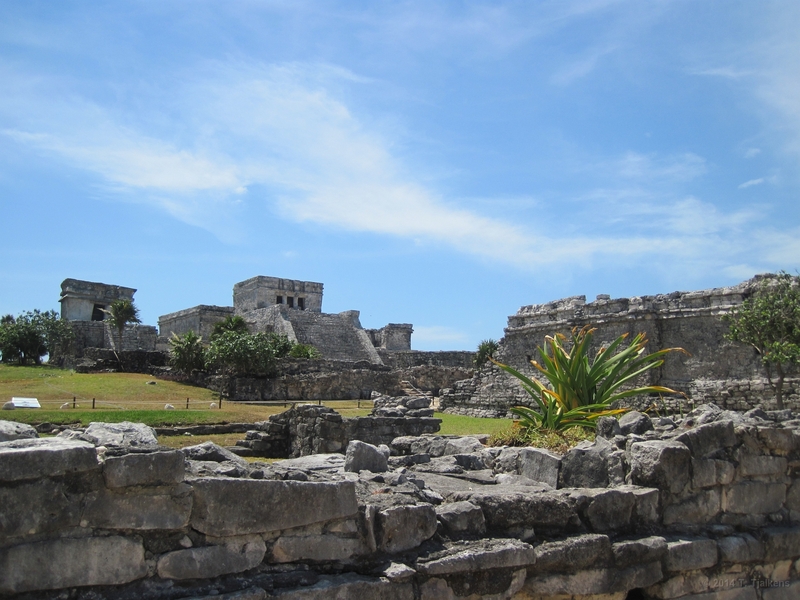 Spanish conquistador Juan de Grijalva sailed past Tulum and was amazed by the sight of it. A walled city with gleaming red, blue and yellow buildings. And a watchtower with a flaming fire atop. 30 The location is really beautifull and Tulum must have been a very important harbour for the Maya's sailing as far as Belize. 31 One of the cenote's near Coba. You are allowed to swim here, the water is cold but cristal clear. It's a strange experience to swim in a cave without sunlight. 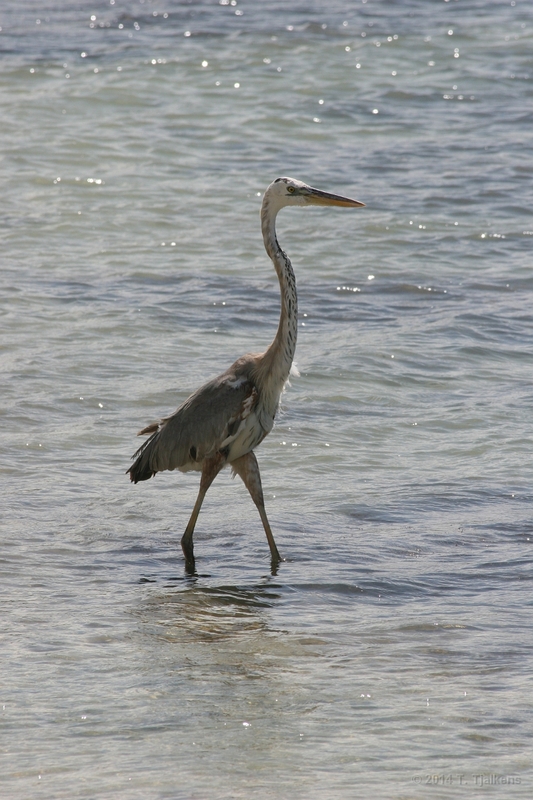 32 A flok of small herons in the lagoon near Punta Allen. 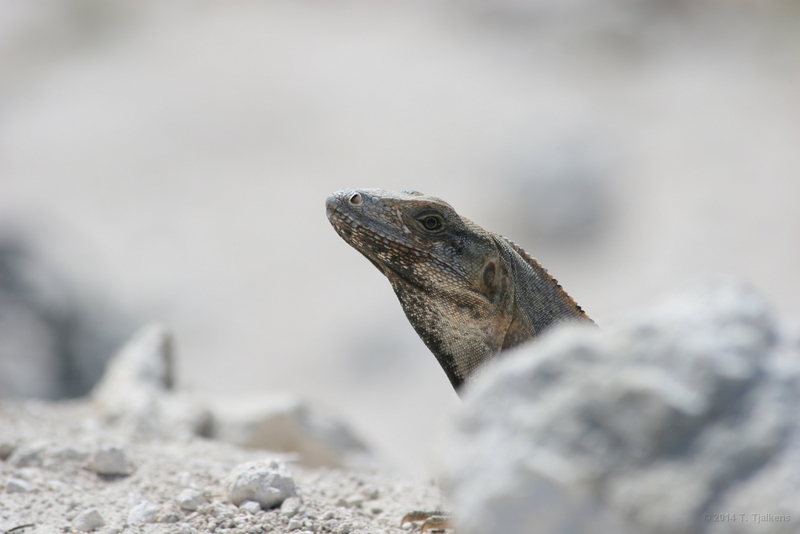 33 This is a big monitor lizzard in the Sian Ka'an National Park. 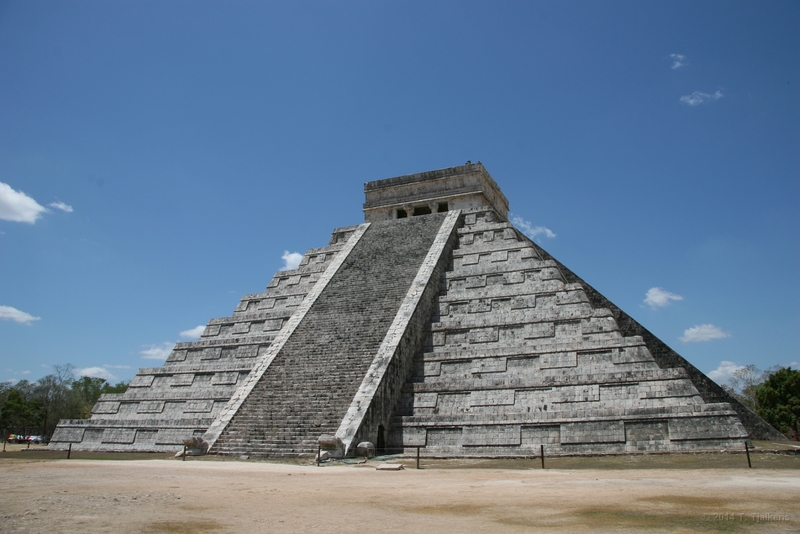 34 One of the most famous ancient buildings in the world: The El Castillo at Chichen Itza. This is a massive Maya calender in stone. With four stairways of 91 steps and the top platform. This makes exact 365. 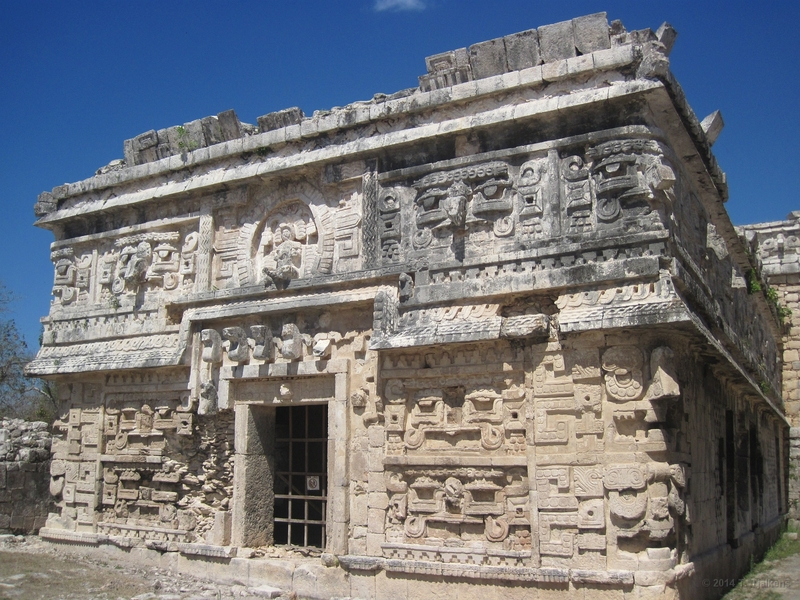 Also the Maya months and years are embedded in this great building. 35 La Iglesia (the church) is totaly covered with carvings, look at the god above the gate and all other details. Amazing what this culture could build. 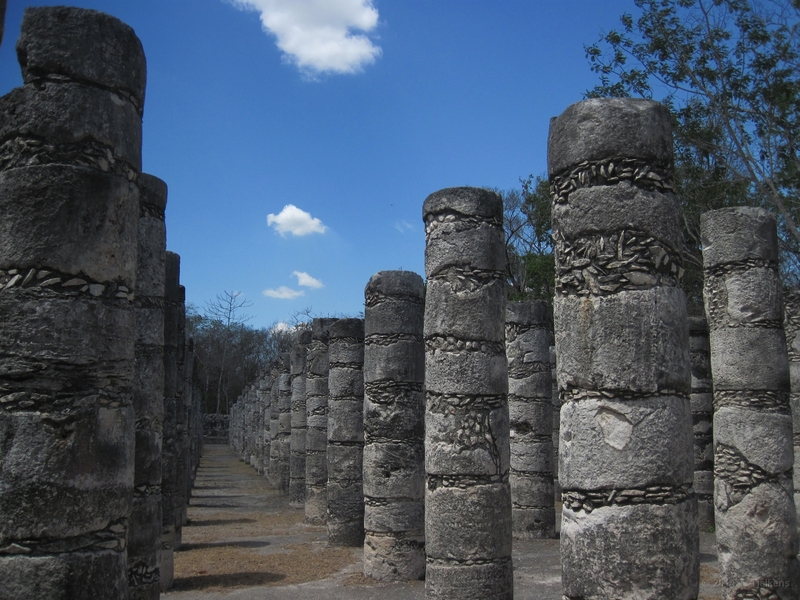 36 Grupo de las mil Columnas (Group of the Thousand Columns). 37 This is the entreance to the Gran Juego de Pelota, the largest and most impressive in Mexico. Winning a game here means losing your head. Captains of the winning team were decapitated. This was a honour, they went directly to the gods. 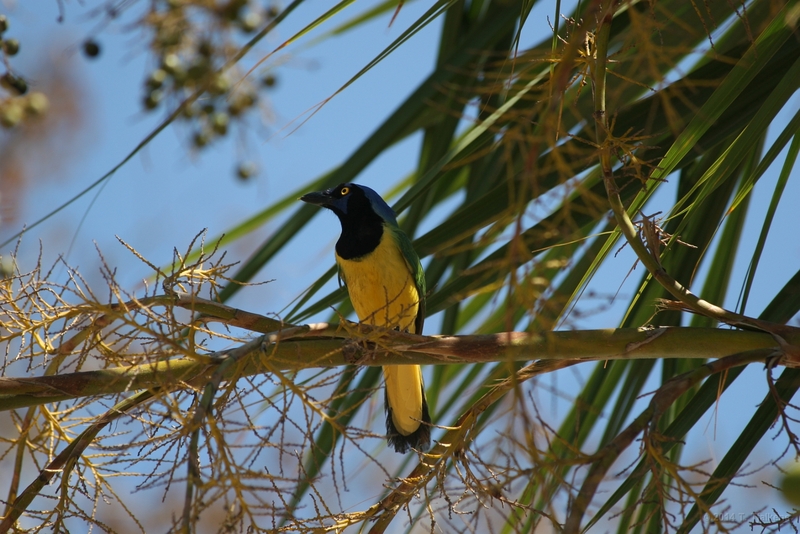 38 Another guess, I think a Yucatan Jay. 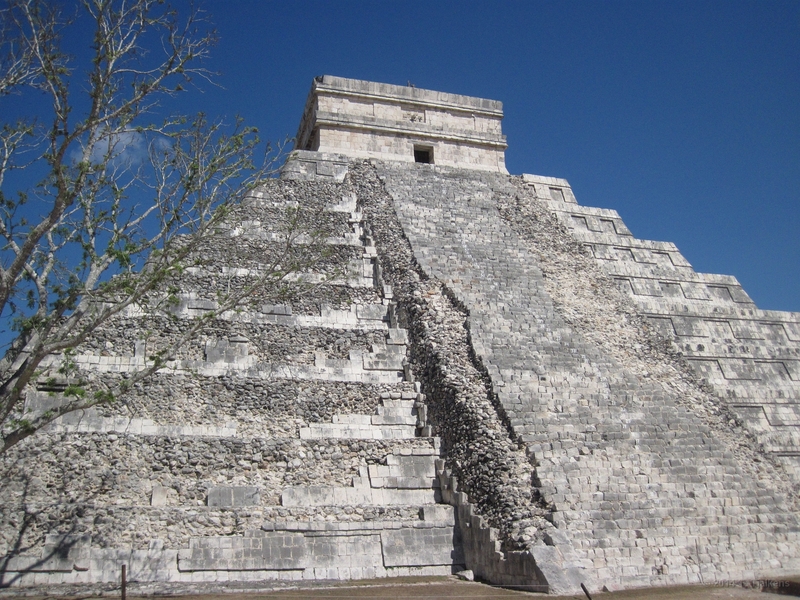 We heve seen this one in Chichen Itza. 39 Another view at the Grupo the las Mil Columnas. 40 El Castilo, with no people, this was when the Mexican flu was a hype. So everbody left Mexico and left Chichen Itza just for us. 41 Maya's liked to behead people, especially prisoners of war. They collected the skulls and displayed them to the people. 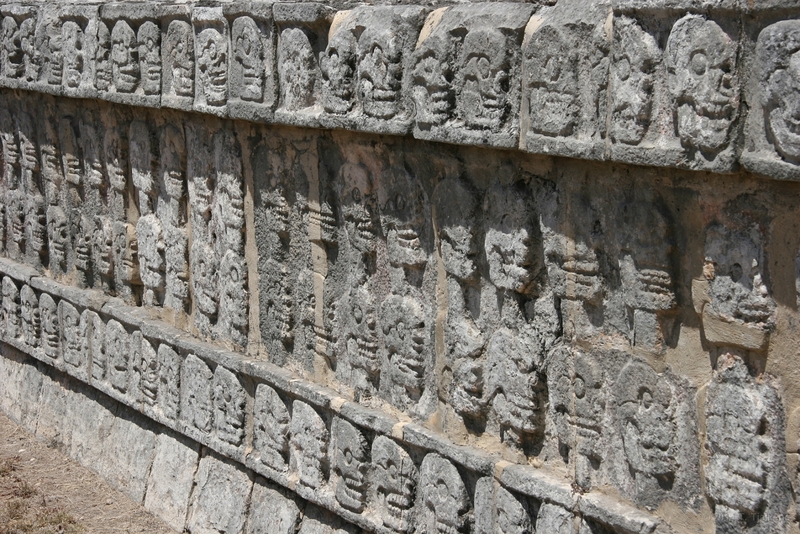 This is a part of the temple where the skulls where displayed. 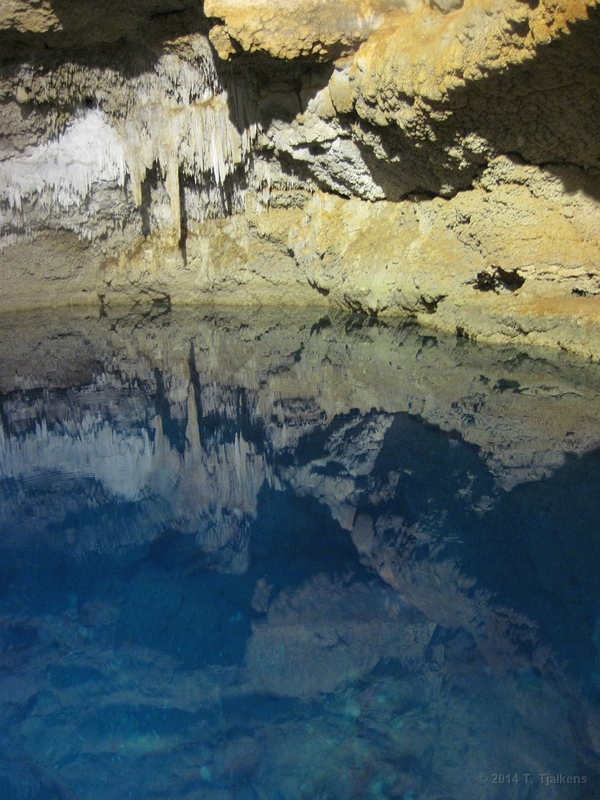 42 The Cenote Sagrado (sacred cenote). 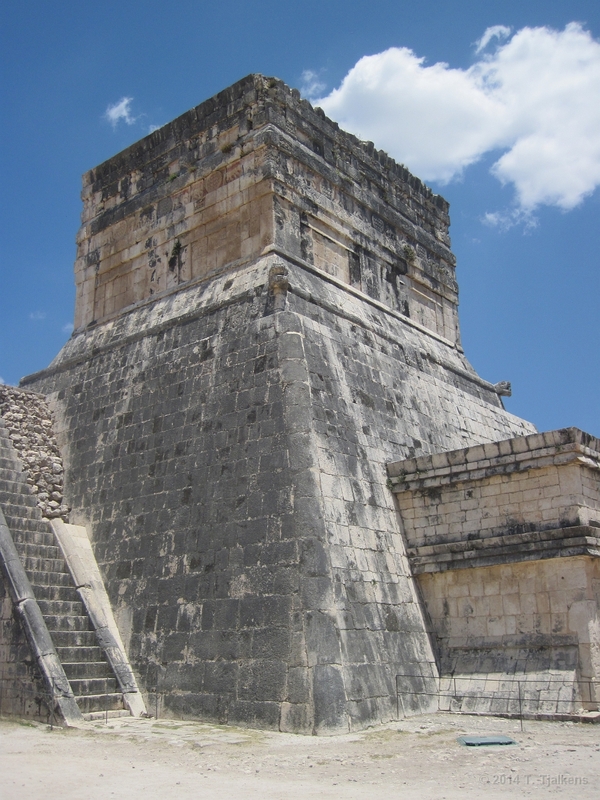 Here Maya's sacrificed jewels, gold and artifacts to the gods. But more frightening, they also sacrificed people, including young childeren. 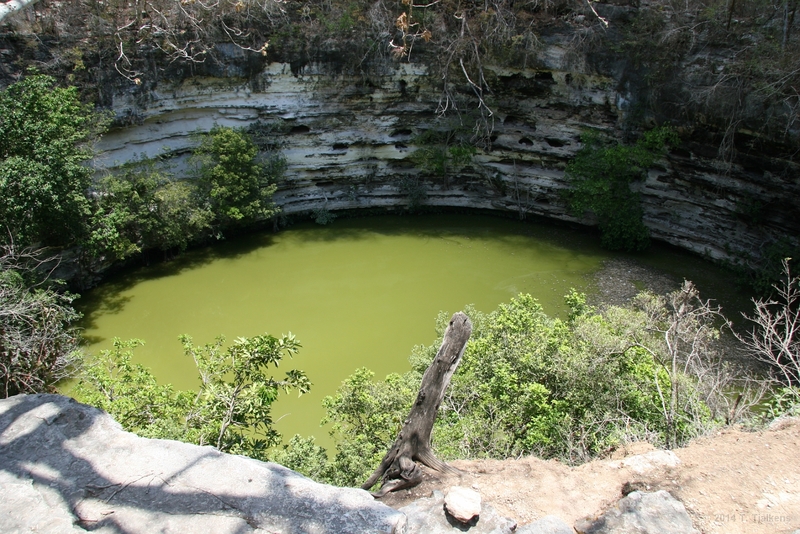 A lot of artifacts, jewels and bones has been recovered out of this cenote. 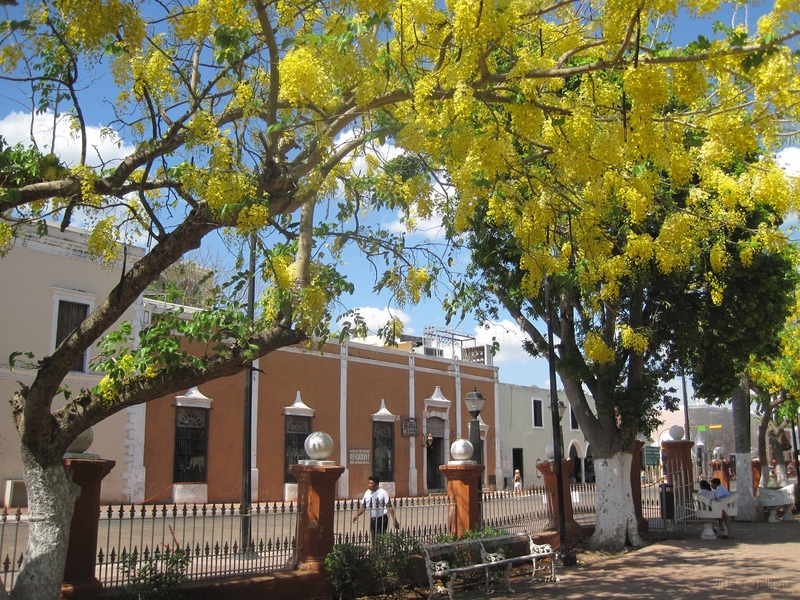 43 Valladolid, a nice town in the centre of Yucatan. 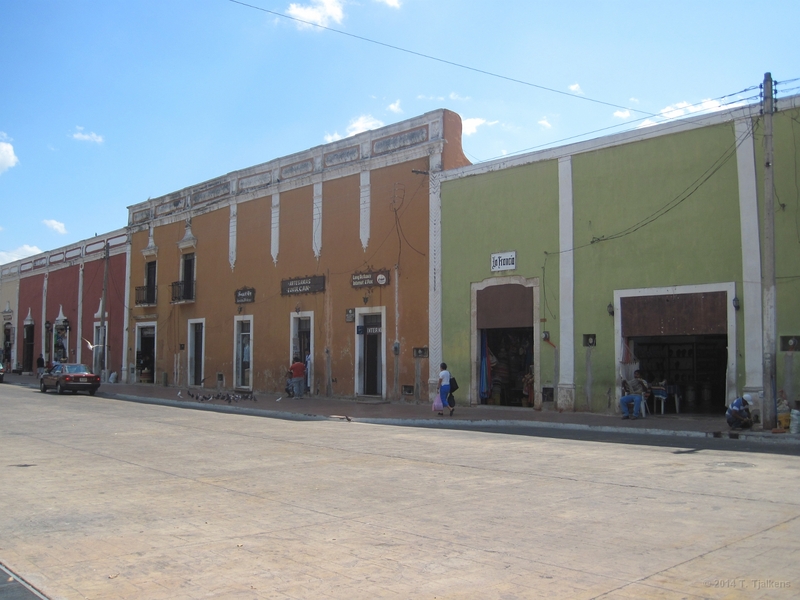 This is how an average old Mexican city looks. It's nice to walk around, look at the shops and drink a cool Sol. 44 A view from the central park in Valladolid. 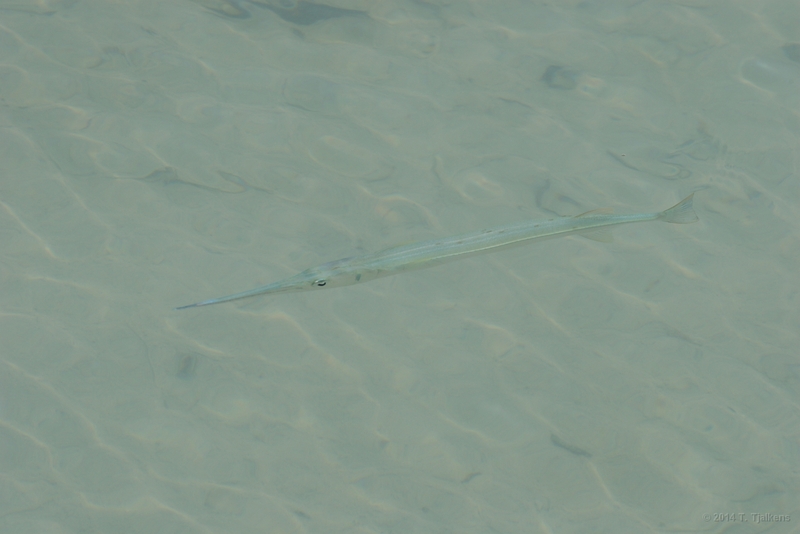 45 Tricolour heron in the sea. 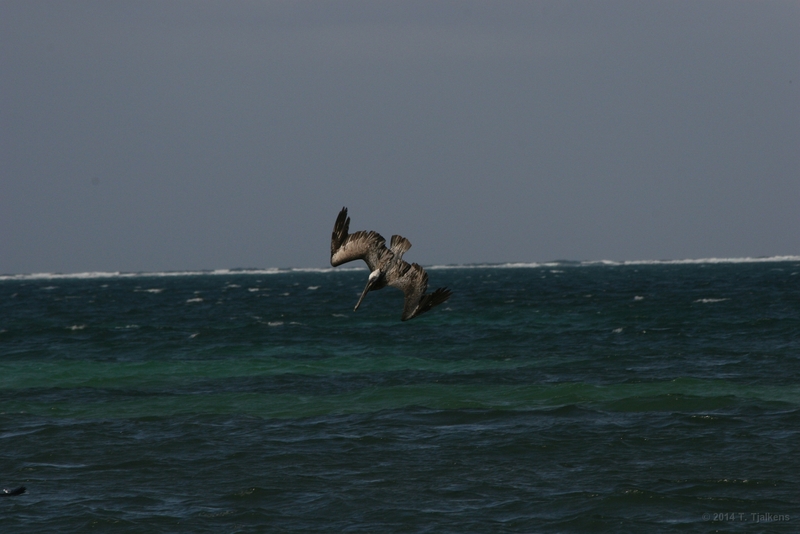 46 A pelican diving for fish near Tulum. 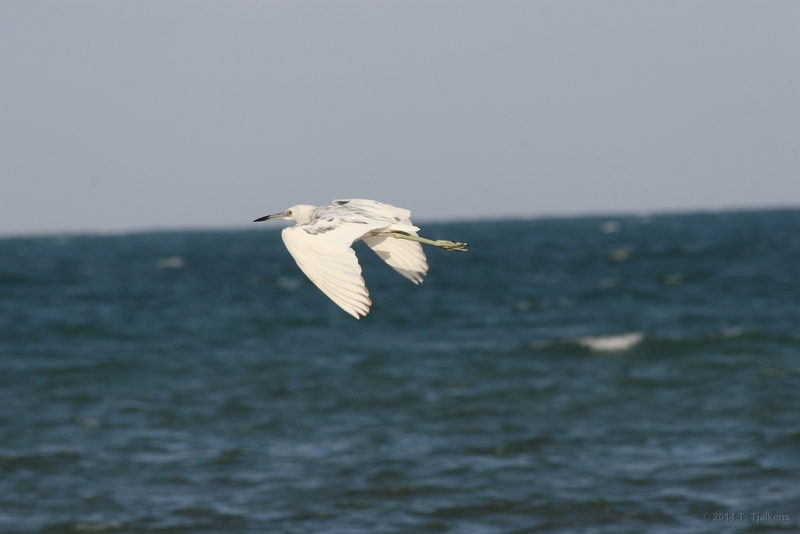 47 A small white heron. 48 This is a fish hawk trying to catch some fish. 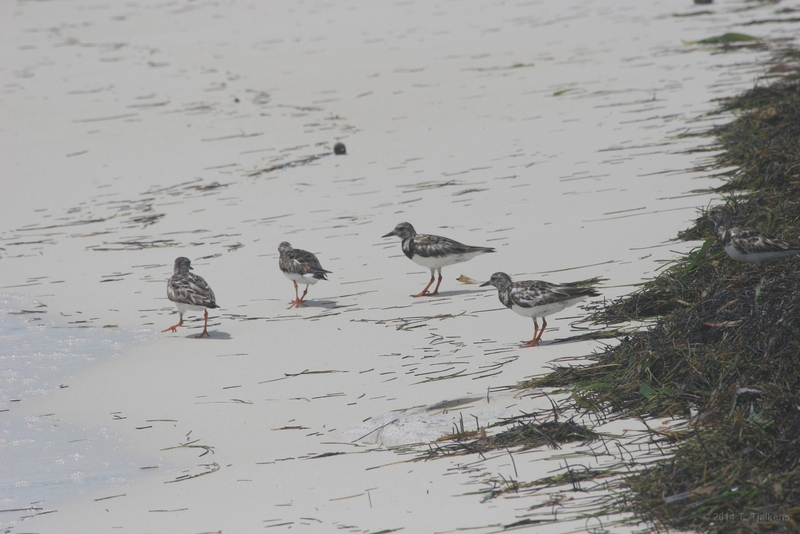 49 A flok of small birds on the beach. 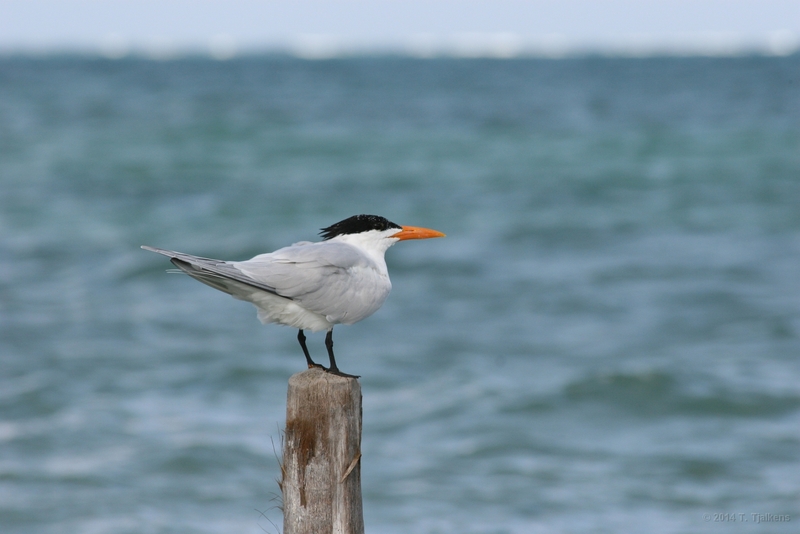 50 My guess is that this a Whiskered Tern, sitting on a pole in the ocean. 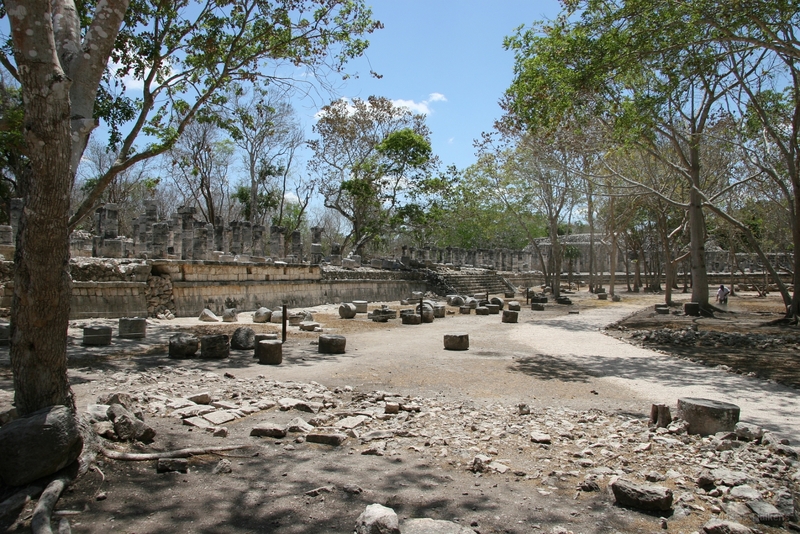 51 Ancient city of Cobá, juego de pelota. 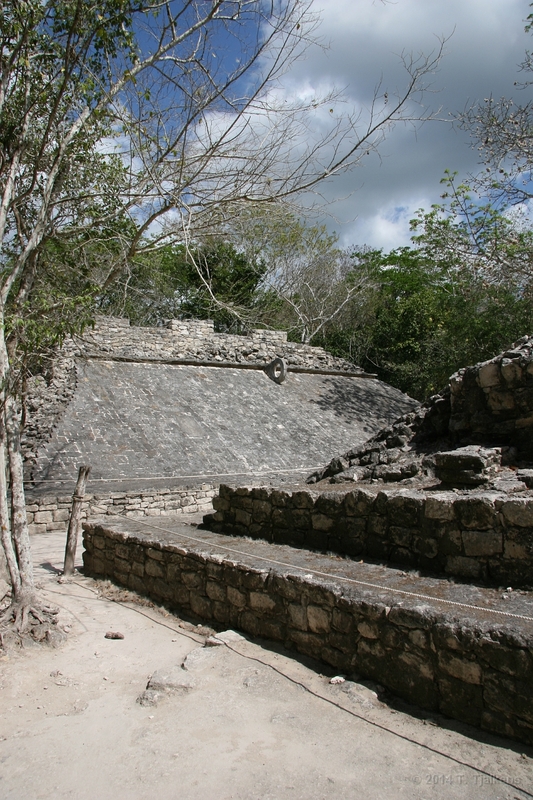 Cobá is in the jungle. Walking around here gives you that Indiana Jones feeling.